The annual forecast, generated from a suite of NOAA-sponsored models, is based on nitrogen loading data provided by the U.S. Geological Survey. The similarity between predicted and measured size emphasizes the role of Mississippi River nutrient runoff in controlling the magnitude of hypoxia. A team of scientists, led by partners at the Louisiana Universities Marine Consortium (LUMCON) and Louisiana State University, collected data to determine the size of the dead zone during a survey mission aboard the R/V Pelican from July 24 to 31. “We expected one of the largest zones ever recorded because the Mississippi River discharge levels and nutrient data from May indicated a high delivery of nutrients during this critical month which stimulates the mid-summer dead zone,” said Nancy Rabalais, Ph.D., research professor at LUMCON and Louisiana State University, who led the survey mission. Map showing area of hypoxia on Louisiana Gulf of Mexico shelf in 2017. Credit: LSU/LUMCON and NOAA. The large size of the dead zone indicates that nutrient pollution from the Mississippi River watershed is continuing to affect the nation’s coastal resources and habitats in the Gulf of Mexico. Excess nutrient pollution comes primarily from agriculture and developed land runoff. These nutrients stimulate massive algal growth that eventually decomposes—a process that uses up the oxygen needed to support life in the gulf. 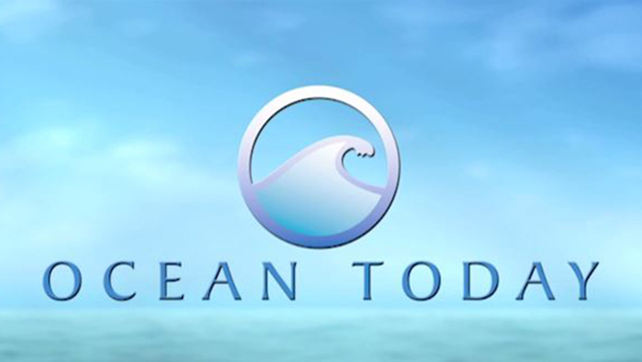 The loss of oxygen has various detrimental effects, including habitat loss, reduced reproductive capabilities in fish, a reduction in the average size of shrimp caught, and displacement of fish populations. NOAA funds monitoring and research efforts for the dead zone in the Gulf of Mexico through the NGOMEX program. The annual measurement of the dead zone provides a critical scientific record and is the primary measure of progress used by the Gulf of Mexico/Mississippi River Watershed Nutrient Task Force (“Hypoxia Task Force”) to determine whether ongoing efforts to reduce nutrient loading upstream in the Mississippi River Basin are yielding results. The largest prior Gulf of Mexico dead zone was in 2002, encompassing 8,497 square miles. The average size of the dead zone over the past five years has been about 5,806 square miles, three times larger than the Gulf Hypoxia Task Force target of 1,900 square miles. 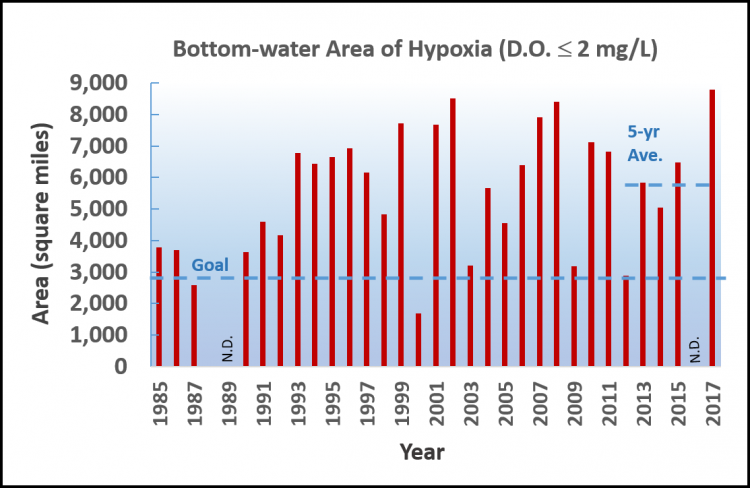 Graph showing measured size of hypoxia zone on Louisiana Gulf of Mexico shelf, 1985–2017. Credit: LSU/LUMCON and NOAA. The research team thinks the best hope for decreasing the size of the dead zone is through the continued nutrient management actions of the interagency Hypoxia Task Force and new initiatives, such as the Runoff Risk Advisory Forecast, which is designed to help farmers apply fertilizer at optimum times to limit nutrient runoff to the gulf. For more information, contact Trevor.Meckley@noaa.gov, or visit LUMCON’s Gulf Hypoxia website, which has additional graphics and information about this summer’s research mission and missions from previous years.